The cotton story is a tangled tale. In many parts of India, farmers are committing suicide. It's been a while Andhra Pradesh, Punjab and now Vidarbha in Maharashtra. What goes into the vicious cycle is indebtedness, brought on by a combination of international trade cycles, state policies on subsidies and tariffs and the trade-off between the interest of cultivators and manufacturers of the products that make cotton a commercial crop. Caught in the spinning wheel, principally, are three of the usual suspects: the us, India and China. The biggest problem is that Uncle Sam gives big subsidies to its cotton farmers, a problem that has been haunting the World Trade Organization (wto) for a while. So India is importing cheap raw cotton, especially the extra-long staple (els) needed for the high-end textile trade. With the death of anti-dumping regulations, India expects a substantial increase in its textile trade and the textile lobby is powerful -- witness the recent proposal, approved by cabinet, to amend labour laws to help the industry deal with industrial ups and downs. Indian subsidies are low restricted to the southward-bound minimum support price (msp) for a small amount of total output, based on quality. Privatisation in procurement has made cotton farmers more vulnerable. But for textile magnates, importing cheap us cotton still remains a more worthwhile option. So, who cashes in? Private traders. And how? The strange thing is that while India is now importing raw cotton, it's also exporting -- through a private procurement and export regime -- mainly to Bangladesh and China. The profits are going to big trading houses, which is why farmers are committing suicide and not traders. Stranger still is the fact that India is exporting cotton to its main rival in the global retail textile market. China imposes huge duties on Indian, and other, raw cotton to protect its farmers, which India does not. But it has overcome that extra cost to become the most competitive player in the global market because it has better technology. sourav mishra unravels the enigma of the cotton story. Unlike the affluent western Maharashtra, represented by successful farmer-politicians like Union agriculture minister Sharad Pawar, which gets plenty of facilities by way of irrigation and credit, Vidarbha gets practically nothing (see graph: Tale of two regions), despite the fact that Vidarbha has harsher conditions mainly low soil fertility and less rain. The figures are telling. Input costs for cotton have risen from Rs 5,000 per hectare (ha) in 1995 to Rs 10,000-12,000 now. Moreover, only 11 per cent of the cotton crop has assured irrigation in Maharashtra. Water charges are also the highest in the country. They vary from Rs 180 to Rs 1,080 per ha, depending on several variable factors. In most other cotton states, water is either free or charged nominal rates in the range of Rs 50 to Rs 200. Productivity is also a problem. Maharashtra has the highest area under cotton -- around 3 million ha on average, each year. This is more than Punjab, Haryana, Rajasthan, Madhya Pradesh and Andhra Pradesh put together. But its productivity is the lowest in the country -- it produces less than Gujarat, where the acreage is half. Cotton farmers survived because of the higher msp paid by the state government and procurement and marketing systems that assured farmers their produce would be bought and sold by the government. Private sector participation in procurement and marketing hit the state schemes in 2002; and higher msps went this year. And suicides started going up. Till 2003-2004 Maharashtra used to be the only state in the country where a monopoly scheme for procuring cotton was in operation. The state used to offer a 20 per cent premium on the central government's declared msp, under the Maharashtra Raw Cotton Monopoly Procurement Act, 1972, to counter low production and prices. The act gave the Maharashtra Cotton Producers' Marketing Federation (mcpmf) monopoly status as the sole procurement agency. Under the scheme, 75 per cent of mcpmf's profit was to be distributed as bonus to farmers while the rest was to be kept as a price-fluctuation buffer. Critics say the scheme was started to help the Mumbai-based textile industries rather than farmers. Visesh Joshi, an activist based in Mumbai, says the scheme was started in 1972 because the international prices were too high and there was a production crisis in India. But, clearly, farmers benefited. This procurement scheme was better than the central procurement scheme by the Cotton Corporation of India (cci). cci procures only 10 per cent of the farmers' produce across the country, based on quality parameters, while mcpmf procured the entire harvest. But over the years, the scheme was destroyed by widespread corruption, which created huge losses. Till 1994, the loss was only Rs 172 crore. The figure rose to over Rs 5,000 crore in 2004-2005, when mcpmf incurred an incremental loss of Rs 1,600 crore. As a result, financial institutions refused to refinance the company, which the Maharashtra government cited as the reason for doing away with bonus and premium schemes. The Maharashtra government breached its promise to farmers twice this cotton season. The initial blow came in the beginning of the 2005-2006 cotton season when the bonus was abolished after 33 years. This prompted farmers to flock to sahukars, who charged them much higher interest. A study by the Tata Institute of Social Sciences on Vidarbha farmers' suicides reveals that about 75 per cent of farmers in the region obtained loans from moneylenders. It also found that most of them had defaulted on bank loans over the last four years, which is why they had to turn to moneylenders. Even moneylenders have become cagier. With rising costs and the advent of Bt seeds increasing credit requirements, the situation has turned desperate . The second blow came mid-way through the season. The government lowered msp from Rs 2,500 per 100 kg to Rs 1,750. This translated into huge debt traps even before the season ended, triggering suicides before procurement started. "The government reduced procurement price to the all-India level to reduce the Rs 5,000-crore loss of the procurement agency, mcpmf," claims N P Hirani, the chief of the agency. "This year's payment crisis has its roots in electoral promises made before past elections. The Democratic Front government (Maharashtra's ruling coalition) promised a rate of Rs 2,700 per 100 kg to cotton growers before elections. But it reneged. It reduced payment liabilities by asking mcpmf to declare a support price of Rs 2,500. Even that went down the tube, ruining most farmers," says Jaideep Hardikar, a journalist and researcher in Vidarbha. "The promise of Rs 2,700 per 100 kg and past years' boom in international markets saw the acreage under cotton rise by 20 per cent. Now with a price crash, the textile mills will have a field day," says Vijay Jawandhia, a farmer leader. The cotton failure in Vidarbha is a lesson in policy failure -- a fact underlined by Gujarat's spectacular success. In the past five years, when cotton farmers of Maharashtra, Andhra Pradesh and Punjab were struggling, Gujarat farmers were making hay, to the tune of Rs 5,000 crore a year. The state's total yield has increased by 5.6 million bales in the past five years. This additional yield means an additional income of Rs 4,275 crore for the farmers, says J V Shah, retired managing director of Gujarat State Seeds Corporation. According to his calculations, 'pirated' Bt seeds have saved Rs 240-250 crore for Gujarat. Pesticide costs have also been saved, to the tune of Rs 360 crore (see table: Staple diet). Gujarat had the lowest productivity in 2000-2001. Today, it boasts of the highest yield in the country, with a growth rate of 433 per cent, compared to 2-5 per cent in other cotton growing states. The cost of cultivation in Gujarat has decreased by 50 per cent, bucking the nationwide trend. This five-year miracle, moreover, was achieved without subsidy, premium msp or any extension support, mainly due to 'pirated' illegal Bt cotton. The parallel, indigenous Bt industry thrived with state sponsorship and protection, though the use of local Bt cotton contravenes intellectual property right (ipr) laws and does not comply with the regulations of the Genetic Engineering Approval Committee (geac). N P Mehta, former scientist with the Cotton Research Station, Surat, who was involved in developing Navbharat-151 says, "We have selected this variety from a desi germplasm collection of 800. It was developed three years before geac approved Monsanto's Bt seeds." 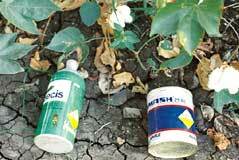 Navbharat says it doesn't need Bt genes because local germplasms can resist American bollworm. But geac says local strains tested positive for Bt. The cotton revolution in Gujarat would not have been possible without the state support, dating back to the mid-1980s when Navbharat got permission for seed research under the state's Cotton Control Act. D B Desai started Navbharat Seeds Company in 1982. International seed firms branded him a biopirate. But Desai says, "We have only one objective providing farmers with the best seeds at affordable prices. And I think we have achieved that over the years. The Central Seeds Act, 1966, was instrumental in the success of local varieties: it provided for farmer-to-farmer seed exchange without inviting provisions of the global ipr regime. With the global regime getting more stringent, the Gujarat experiment is the obvious way forward for developing countries. Punjab and Rajasthan have just begun replicating it. Another 49 companies handle about 20 per cent. The smaller companies handle the rest. Both private and state-owned companies are involved: the latter controlling 60 per cent. Private companies dominate trade in most other commodities. The preponderance of state agencies means that government policies kick in to affect pricing, mainly through subsidies. Developed nations offer the biggest subsidies, distorting international trade, usually to the detriment of third world producers. More than a fourth of the earnings from raw cotton production come from government support to the cotton sector subsidies, in other words. Support to the cotton sector is greatest in the us, followed by China and the eu. The combined support (domestic and export subsidy) provided by the us government to cotton producers is pegged at us $4 billion. China provides us $1.5 billion, while the eu's support of us $ 900 million is mainly for Spain and Greece. Subsidy encourages surplus production and deflation of prices. International prices have decreased continuously over the last 30 years (see graph: Downturn) when the us started its aggressive subsidy programme, through funding storage in 1985 and price support in 1996. In this century, the us has gone a step further. us cotton imports are now covered by the Step-3 Farm Policy of 2002, which allows imports of specified quantities for specific periods of time, thus protecting domestic production. The us subsidy system is based on direct payments to farmers who can sell cotton in world markets at prices well below the cost of production. Production costs are us $1.70 per kg but its cotton is sold at us $1.18 per kg. Export subsidies for 2005-2006 amount to us $ 360 million. The same goes for the eu subsidy. Its support programme began in 1981 when Greece and Spain joined eu's Common Agricultural Policy. Together, Spain and Greece accounted for 2.5 per cent of world production and 6 per cent of world exports in 2001, but they account for 16 per cent of world cotton subsidies. "If the eu subsidy is removed, the cotton crop will be wiped out from Greece and Spain," says a 2005 Oxfam report. The average level of assistance across subsidising countries is us $0.58 per kg, 48 per cent of average prices. The worst losers are farmers in the least developed countries (ldc). This subsidy is helping only a few thousand farmers in the developed nations but is putting millions of poor Africans into a death trap. For example the us $4- billion subsidy that the us gives is only meant for 20,000 farmers who cultivate cotton in that country," says D K Nair, secretary-general of the Confederation of Indian Textile Industry (citi). The fact that many countries in west and central Africa are heavily dependent on cotton exports makes the situation worse. In Benin, Burkina Faso, Chad, Mali and Togo, cotton accounts for two-thirds of agricultural exports and one-third of the total exports, meaning many livelihoods depend on growing cotton. In many non-African countries too, cotton is a major source of export revenue. In Uzbekistan, Tajikistan and Turkmenistan, it accounts for 45, 20 and 15 per cent of total commodity exports and make a significant contribution to gdp (8 per cent in Uzbekistan and Tajikistan, and 4 per cent in Turkmenistan). At the individual level, a fall in prices means attrition of incomes that are already, in many cases, close to subsistence level. At the macro level, it means that adverse terms of trade reduce revenues of governments in these countries and therefore their capacity to put in place programmes for livelihood security -- say, in this case, subsidies to their cotton farmers. It's a vicious circle. In the wto era, Brazil disputed the issue of cotton subsidies of the us in April 2004. The dispute-settlement panel ruled in favour of Brazil. The cotton issue is so important for the livelihood of the African nations that the wto ministerial in Hong Kong decided to remove all kinds of export subsidies from cotton by 2006 and allow a duty-free and quota-free market access for exports from ldcs. But this is cosmetic surgery, given that export subsidies account for less than 7 per cent of total subsidies given by developed countries. Most subsidies are domestic and remain untouched by wto rulings. Tariffs are also an issue. The average world import tariff on cotton is 5.3 per cent, ranging from China's 90 per cent to zero for 64 countries including members of eu, Australia and Turkey. Of the other large cotton-producing countries, Brazil imposes a tariff of 9.2 per cent, India 10 per cent, Pakistan 5 per cent and Uzbekistan 30 per cent. The average tariff for West and Central African countries is 7 per cent. The us has variable tariffs ranging between nothing and us $0.31 per kg. India trades in almost all segments of the cotton market either as buyer or seller. Projected figures show it will be the third largest producer, second largest consumer and fourth largest exporter of cotton in the world in the 2005-2006 season. It used to be the 10th largest importer till last year. This year, however, imports are likely to see a decline of 600,000 bales from last year's 1,200,000 bales. India will end with the second highest closing stock of cotton this year (see box: Balance sheet), more than the us and just below China. a pact that ensured that textile trade was freed from tariff and non-tariff barriers -- at the turn of 2004 has opened opportunities for India's textile exports. India has always been a big player, but has played second fiddle to China, ever since it implemented its policy of market socialism under Deng Xiaoping in the early 1980s. Note: As on 7.12.2005; Figures in million bales of 170 kg each.The import figures do not include private imports. Take the pesticide problem. Although cotton occupies only 5 per cent of India's agricultural land, it accounts for 54 per cent of pesticide use. Andhra Pradesh cotton growers use more than 30 per cent of the country's pesticides and almost 70 per cent of pesticides used for growing cotton. "Since the advent of the green revolution we have been surviving on a high pesticide dosage. We adopted alien varieties, which brought new diseases and to control them we resorted to excessive use of pesticides," says Y S Ramakrishna, director, Central Research Institute for Dryland Agriculture. The pattern of pesticide use that is followed has led to pests developing immunity, which in turn leads to even greater use of these chemicals. It's a vicious upward spiral that increases the cost of farming, adversely affects soil quality and, therefore, yields. This is one of the major reasons for suicides in Andhra Pradesh and Punjab. The first major cotton crop failure occurred in the mid-1980s by the whitefly bug. The synthetic pyrethroids class of pesticides failed. It was then that farmers started using alternative pesticides like endosulphan, quinolphos, monocrotophos and chloripyriphos. But even these failed. In the mid-1990s, various varieties of the bollworm pest -- American bollworm, pink bollworm and spotted bollworm -- arrived. The devastation was spectacular. The epidemic claimed more than 10,000 lives countrywide. The pest was contained only when Bt cotton came into play. But Bt is resistant only to American bollworm. New low-volume pesticides, such as Avaunt, Tracer and Imidachloprid, which are supposed to be environment-friendly, have been introduced. They are seven to10 times more expensive than the earlier ones. But the future is uncertain with the advent of new varieties of pests. Cotton is the only genetically modified (gm) crop to be cultivated in India. gm cotton accounted for an estimated one-third of the total cotton acreage in 2005-2006, which also includes illegal Bt cotton, mostly in Gujarat, Punjab and Rajasthan, where the yields are the highest. But the exorbitant price of Bt seeds and royalties are areas of concern (see box: Grey areas). Besides, they do not always fit into Indian conditions. Scientists also believe a variant that suits Indian conditions must be developed soon. When Monsanto and the us department of agriculture developed Bt cotton, they considered pest incidence, existing varieties and agro-climatic situation in the us. The gm variant chosen was Cocker-512. Considering Indian conditions, this variant is not the best possible option, and second, when Bt hybrids were developed in India, Cocker-512 was crossed with Indian strains. This reduced the effectiveness of pesticidal toxins. Given India's vast biodiversity, the problem of introducing gm seeds becomes very complicated. Since Bt seeds were developed without taking this diversity into account, its success was limited. After constant criticism of the initially introduced Bt varieties, Monsanto came up with Bollgard- II , an improved variety. "This is 10 times better than the earlier version and it includes a new gene Cry2Ab," says Ranjana Smetacek, director, corporate affairs, Monsanto. Senior scientists at cicr agree. "This is a better technology, no doubt, but the question is if they can do this today why not earlier," adds Sahai. But problems remain. The long gestation period involved in developing new seeds is one of them, Smetacek says. American cotton -- Gossypium hirsutum -- and its hybrid varieties today cover 70 per cent of the cultivated area in India while only 10 per cent of the area is under the Indian variety, Gossypium herbaceum . 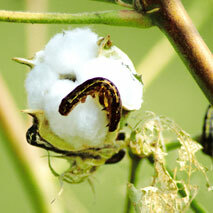 But American cotton is not suitable for Indian situations, which leads to frequent crop failures. It has brought numerous diseases, including the notorious American bollworm. It also requires at least three times more water and other inputs and its yield plummets after three years, unlike Indian cotton, which gives the same level of yield for 30 years. Although not suitable for Indian conditions, the long staple American cotton is popular because machines to gin and spin Indian cotton are not readily available. The technology problem dates back to the mid-eighteenth century when Richard Arkwright invented the first spinning machine based on the staple length of American cotton. All machines developed subsequently were based on the same model. After the us civil war, when Lancashire started importing cotton in a big way from India, the mills found Indian cotton unsuitable. Lesser staple length meant that the fibre broke frequently. To avoid the high costs that were likely to go into fresh innovation, the colonial government introduced and promoted American cotton in the country. But these attempts were unsuccessful because it could not cope with Indian conditions. Although American cotton could not replace Indian cotton, the Britishers replaced the best Indian varieties and succeeded in introducing it in some regions. Ironically, while after partition only 3 per cent of area under cotton was covered by American cotton, it has now risen to 70 per cent. To buck this trend, the technology issue has to be addressed. A roller-ginning machine best gins Indian cotton, while the charkha is the best spinning option. A roller-ginner is slow and labour-intensive, but produces fabric of better strength, as fibres don't break very often. In the wake of increasing textile exports more centralised ginning is preferred. The charkha is best suited for spinning Indian cotton varieties. Although a time-consuming process, spinning with the charkha could generate more employment by providing a decentralised system of manufacturing. Unfortunately, after Gandhi few people have tried to promote the charkha or improve it technologically. One important innovation was the 'Amber Charkha', which was developed by a Gandhian, Bholanath, in the 1960s. In recent years, a novel initiative has been started by an ngo called Dastkar Andhra in Chirala village in Prakasham district of Andhra Pradesh. The village has adopted a decentralised system. A 62-year-old woman, Uzramma, leads a team of 41 spinners and weavers. To facilitate this operation, Vortex, a private company, has designed and developed a machine that consists of an assembly of 21 motorised Amber charkas. The technology has been developed taking into account village-level factors like spinning small lots of cotton of variable quality, meeting the diversity of yarn specifications of small looms and availability of small and low capital costs," says L Kannan of Vortex, who designed the machine. This technology discards a large number of expensive steps like baling, transport of bales etc, says G V Ramanjaneyulu of the Centre for Sustainable Agriculture, Hyderabad. These are not the only problem areas in this sector. Water is a big concern. Growing cotton is water-intensive at the best of times as is manufacturing textiles and treating the waste generated. In India, cotton guzzles more water than anywhere in the world -- even more than the other extremely water-intensive cotton crops of China and the us. India has the largest area in the world under cotton, 9.5 million ha in 2004-2005 -- almost double the 1950 figures and 21 per cent of the global acreage. According to estimates of thae Food and Agriculture Organisation (fao), one cotton plant needs 700-1,300 mm water, depending on the climate and the growing period. In the early stages, the water requirement is 10 per cent of this figure, while during the flowering period, when the leaf area is dense, the requirement is about 50 to 60 per cent. According to the Union ministry of agriculture, only 35 per cent of the area under cotton is irrigated, the rest is rain-fed. Conventionally, Indian farmers use the furrow irrigation system. According to research by Jain Irrigation Systems, a Maharashtra-based manufacturer of micro irrigation systems, a switch to drip irrigation can save 53 per cent of water and increase the yield by about 27 per cent. A technology mission on cotton was launched in February 2000 to address these issues, which worked in four phases. The agenda for the first two was the development and implementation of integrated water management practices including water-saving devices like drips and sprinklers. But there is no data on its achievements. It is important that irrigation strategy is worked out because the area under cotton is certain to increase. Water saved by improving irrigation practices will have to feed the new acreage. Policy-makers will also have to factor in the impact of textile-processing units in Pali and Balotra in Rajasthan, Jetpur in Gujarat and Tirupur in Tamil Nadu, which create conflicts over water use. Once spinning and weaving have been done, the processes that follow require clean water. According to research by the Centre for Science and Environment, based on the wastewater data of the Central Pollution Control Board ('Industrial water use: Overused, underrated', Down To Earth February 2004), the water consumption of the Indian textile industry is about 2,200-2,900 million litres per day (mld). Of this, 25 per cent is consumed by small-scale industries. While consuming clean water, the textile industry pollutes water sources forcing industrialists to shell out huge sums on water. "As the total dissolved solid (tds) content in groundwater is high, we buy 120 kilolitres (kl) water a day from adjoining areas," says Mangilal Gandhi, owner of Sankeshwar Fabrics, Pali. 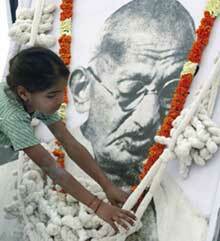 Gandhi spends Rs 50 lakh a year on water. Official water requirement for industries in Pali is 34 mld. Different agencies estimate the water requirement of Tirupur between 85 mld (Tamil Nadu Pollution Control Board) to 120 mld (dyers' association). Groundwater is the backbone of Tirupur. Estimates show that roughly between 2,000-3,000 tankers of capacities between 10 and 12 kl make 7 to 10 trips daily to Tirupur with the costs fluctuating between Rs 1,000 per tanker during summer to a low of Rs 100 during monsoon season. K Dhanapal, former member of the Madras High Court-appointed expert committee to look into the matter of pollution in Tirupur and director, epic-in, a Coimbatore-based ngo, says, "Wet processing units in Tirupur spends Rs 115 crore annually on groundwater." Water for Tirupur's industries come from surrounding blocks like Avanashi, Palladam, Annur, Kangeyam, and parts of neighbouring Erode district. Pali gets its groundwater from a radius of 10-20 km. P K Batra, a hydrogeologist of the groundwater department in Pali, says, "Due to heavy extraction, groundwater levels are falling at the rate 0.62 m a year." Surface water is costly, while using groundwater is an unsustainable option. Industrialists in Tirupur, along with the government of Tamil Nadu, floated the New Tirupur Area Development Corporation Limited (ntadcl) in 1998 to supply 125 mld of Bhavani water at a cost of Rs 1,000 crore. Says Dhanapal, "At present for a small-scale dyer, tanker water (Rs 10-20 per kl) is cheaper as compared to Bhavani water which is Rs 45 per kl." Kandasamy, president, Tirupur Dyers Association, brushes aside the concerns, " ntadcl water is clean and needs no pre-treatment and hence no additional costs." However, groundwater levels are expected to fall, because ntadcl 's present supply of 50 mld is way below the dyers association's estimated requirement. The Indian textile industry is not water-efficient. Michael Crow, an mit researcher who has studied small-scale bleachers and dyers in Tirupur says, "Water requirement is 250 kl and 80 kl for dyeing and bleaching a tonne respectively." According to K P Nyati of the Confederation of Indian Industry, the combined global best figure is 100 kl per tonne." According to Kandasamy, the volume of clothes processed in Tirupur has risen by 50 tonnes per day in 2005-2006. With exports zooming after the scrapping of mfa, cotton textile output has also risen, increasing water needs. Cotton has a long and tortuous history in India and its ramifications are extremely complex. The origin of the problems of today's cotton farmers was the attempt by the British to introduce long-staple American cotton, which did not suit Indian conditions. This was compounded after independence, when the establishment continued to push long staple. When Gandhi picked the charkha as his symbol, he had, as usual got it right. Not only was it a symbol of self-reliance and resistance to imperialism, with its potential to fight the dominance of the Lancashire textile industry, and a means of providing decentralised employment, it was also appropriate technology. Since India grew short-staple cotton, which the charkha spun well, while the mills didn't, it would have been rational to use it, modify it and develop its potential. That would have solved a lot of problems. On the ground, it would have meant that farmers could have cultivated their crops cheaper because the native varieties needed less water and were more resistant to pests, meaning expensive pesticides would not have to be used. Moreover, farmers would not have to be dependent on the West for expensive seed technology gm and perhaps state-of-the art textile machinery to bring down costs (as China does) to be globally competitive. But not all the problems that the Indian cotton farmers face are of the Indian establishment's making. An iniquitous system of global trade is a major contributor. The us and, to a lesser extent, the eu, gives huge subsidies to their cotton farmers giving them an unfair advantage in the global market. But here too India can be faulted. Unlike China, India does not protect its farmers by erecting tariff barriers against cheap us cotton. The reason is that it has a conscious policy of protecting the interests of the powerful textile lobby, which wants to be price competitive globally without investing heavily in technology as China does, remaining the most competitive global player in the textiles and garments sector despite its high tariffs. In today's world, the charkha or charkha -based technologies may not be the final solution to the problems faced by cotton farmers or the needs of the textile industry, but it is surely a powerful reminder that it may just be profitable for us to reinvent the wheel.